If you are reading this we know you are serious about taking care of your property. Please continue reading to learn more about how we can help, the right way. We will NEVER use a pressure washer on your asphalt shingled roof! We guarantee all Algae will be killed and removed down to the roots. Further, we guarantee that Algae will not re-infest your roof for a period of one (1) year. If Algae does return to the area we cleaned within one (1) year, we will re-clean the area at no additional charge to you. Mold has proven to be harmful to our health. Your roof is growing mold and black algae that can be removed. Your insurance company may deny your claim for a leaky or damaged roof due to poor maintenance. If not removed, the mold on your roof acts like a wet carpet that causes the wood underneath and your shingles to rot. Roof cleaning safely removes mold and results in longer shingle life. We use a biodegradable detergent and rinse process that stops the mold from coming back for years. Satisfaction is guaranteed! You can avoid the cost of replacing your roof prematurely by cleaning and protecting your investment. Reduce the heat within your attic and lower your energy costs by removing the heat absorbing black stains! If you do not remove the black algae it can spread to your siding & trim, pool, walkways, driveway and patio! It's better to spend a little bit now than a lot more later! It costs on average 92% less to clean your roof than to replace it. Something you may not have considered. Having your roof cleaned actually makes sense. It isn’t just aesthetics. While people like to say that dirty roofs lower a property’s value and may make it hard to sell, the “dirt” on a roof actually shortens its life span and can even present a health hazard. Furthermore, the “dark stains” on a roof act as a sponge to absorb the sun's heat, which causes a rise in the temperature inside a home or building, creating higher air conditioning bills. The dirt isn’t just dust – It’s alive. Some of the black or very dark roof stains are caused by a resilient type of algae, Gloeocapsa magma (a type of blue-green algae commonly found in climates with warm, humid summers). The algae grow in standing water, as well as in our lakes and ponds. The algal spores are carried to our roofs from the water sources by the wind and birds, and then from roof to roof where it grows and feeds on the limestone filler in asphalt shingles and the real dirt on tile roofs maybe in some cases the tiles themselves. Worse still, as the algae grow, they retain water and foster the growth of other roof inhabitants. The tar used in roofing is fossilized, dead organic matter -- and an important food source for fungi. Asphalt, at the granule base, is normally consumed first. Once these granules dislodge, accelerated deterioration will occur. Ceramic granules represent the outer hard shell that protects against hail and other falling debris. Ceramic granules protect against damaging UV radiation and insulate the roof against extreme heat. So you can understand that their dislodgement by the growing fungal colonies can be detrimental to our roofs’ longevity. Surprisingly, the blue-green algae are also food for the fungi. Most of us have immune systems that are fully capable of resisting the effects of fungi described above. As a result it would be highly unlikely for any of us to suffer any of the ill effects described. But if fungal colonies are allowed to persist and multiply then the high concentrations of the molds and their volatile organic chemical metabolites might be sufficient to increase the risks from our exposure to them. This Algae, known as Gleocapsa Magma, produces it's own energy and feeds on inorganic materials like calcium carbonate, which is used as a filler in your asphalt shingles. The Algae also produces a dark pigment to protect itself from ultraviolet rays, thus giving it the unsightly black color that results in a streaked, dirty-looking roof. The growth usually first appears on the north slope of the roof where extra shade and moisture provide an ideal environment. Once established in an area, it develops rapidly and spreads across the entire roof. Airborne spores can then be carried from rooftop to rooftop, infesting entire neighborhoods. 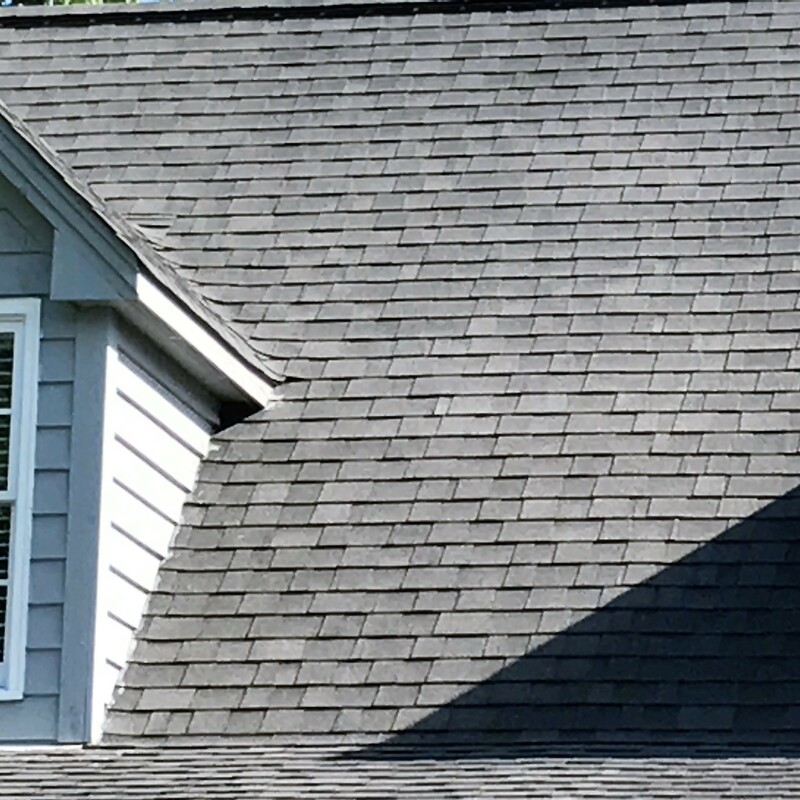 We use a system as recommended by manufacturing companies like Owens Corning and GAF, and also the Asphalt Roofing Manufacturers Association. They recommend a low pressure chemical application using certain cleaners to restore shingles suffering from roof algae, followed by a low pressure rinse (garden hose). We use the cleaners and methods recommended by these companies, for a safe and damage free roof cleaning. 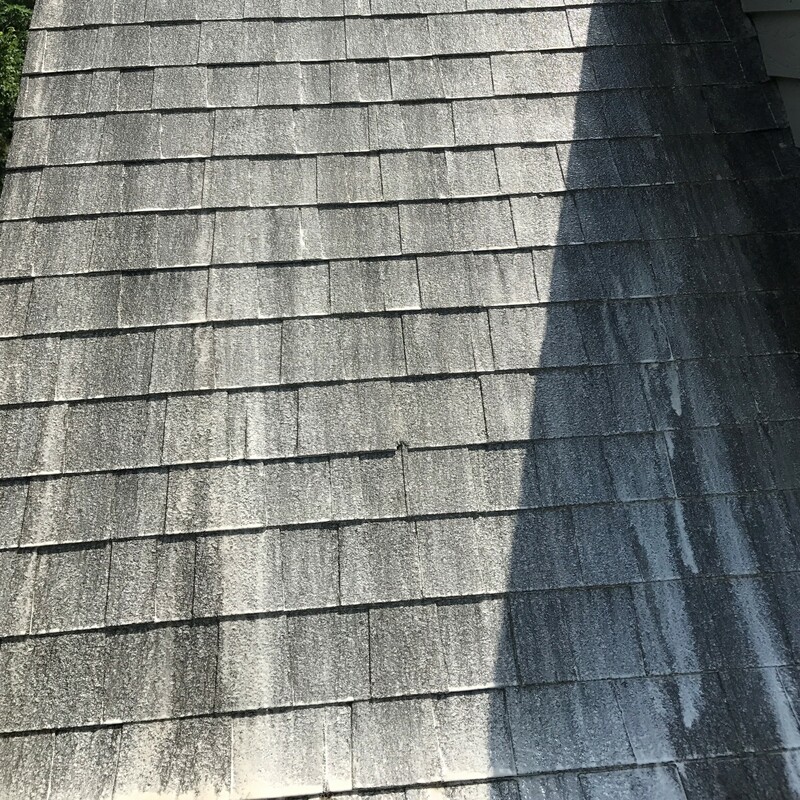 If your shingles are still in good shape but have roof algae on them, having your roof cleaned will allow you to get the full life out of your shingles, saving you thousands of dollars. Here is a link to ARMA (Asphalt Roofing Manufacturers Association) information for Algae Discoloration of Roofs.